Today we are sharing St. Patrick's Day Recipes with our Festive Foodies group under the direction of our friend Carlee from Cooking with Carlee. Our pastor is from Ireland and it tickles him that St. Patrick's Day is such a thing here. Evidently it is not celebrated in Ireland as it is here. In fact, the thought of green beer? Well, it makes him turn green LOL. He, however, is always up for a toast and a party so perhaps that is where the American tradition started. Whatever the reason.....we do whoop it up around here. We have parades. We eat corned beef and cabbage. We party and yes, we drink beer tinted green. I often have dinner parties to celebrate St. Patrick's Day, especially since my brother's birthday is on the 18th of March. We are not Irish but it gives me a theme for his birthday dinner when we have it. The dish I am serving today wasn't made for my brother's birthday but it was made for a family dinner and served along with a Roast Pork Loin and a wonderful Apple/Fennel and Beet Salad. This combination of potatoes, cabbage and kale hails from Medieval Ireland and comes from the Gaelic, cal ceannann, which means white headed cabbage. The recipe that I'm sharing with you today comes from Cuisine at Home and was part of a Springtime menu that they shared. I actually made the entire menu for dinner and was very pleased with the outcome. Creamy and delicious, these potatoes take no more work than regular mashed potatoes but add lots of nutrition with the cruciferous veggies that are included. Everything gets boiled up together, drained and placed back into the pan and onto the burner for a few minutes to make sure the ingredients are dry before adding the butter and cream and hand mashing to a delicious finish. The final touch is to stir in some grated Irish white cheddar and the results are magnificent. This recipe fed 6 of us for dinner with just enough left over for me to make Colcannon Potato Pancakes for Meatless Monday the next day for dinner for me and Frank. You will find a whole slew of St. Pat's recipes linked below and there is tons of time for you to plan your celebration. This looks amazing, and I love the idea of turning the leftovers into potato pancakes! LOL...Happy Birthday to your brother up in heaven Colleen. I too, have a brother in heaven. Losing a sibling is the hardest thing ever. Perhaps they will share a green beer together this year. 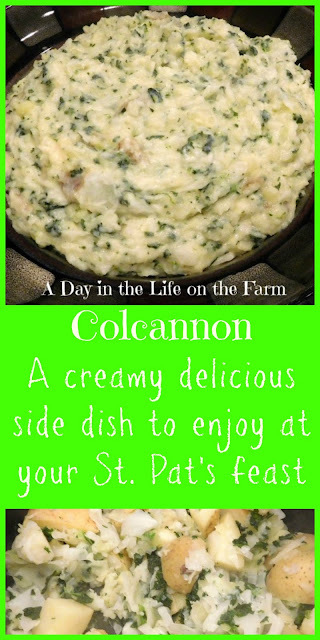 Colcannon is one of my favorite dishes for St. Patrick's day. What's funny, is the Irish in Ireland are beginning to celebrate the day the same way we do! It's evidently a new thing. Too funny Karen....Any excuse for a celebration is a good one. Colcannon is something I know I'll love, but I have yet to make it. I need to get on it this year! Easy peasy and delicious Carlee. Who says St. Patrick's Day has to be about green beer? Not me! I think this year we'll stay home and enjoy a little luck of the Irish with some corned beef and this wonderful comforting side dish!! Sounds like my kind of celebration too Susanne. I love all the ingredients in here. Together it sounds dynamite! It was really good Cindy. I love colcannon and your version sounds so wonderful! It is a great side dish to eat all year round! It sure is Amy. It will be made here throughout the year now that we see how delicious it is. mmm! I love this version with cabbage, Kale and cheese! Going to have to give it a try! The Irish white cheddar cheese sounds like the perfect addition to this delicious looking dish! How fun your pastor is Irish. I bet he has a grand time with our American celebrations! Your dish looks warm and comforting. It is fun....and he has that very dry Irish humor. Not all the parishioners know how to take him.